It’s always kind of a crapshoot when you turn a coupe into a convertible. Sometimes you get something stunning, and sometimes you get the Nissan 350Z Roadster. 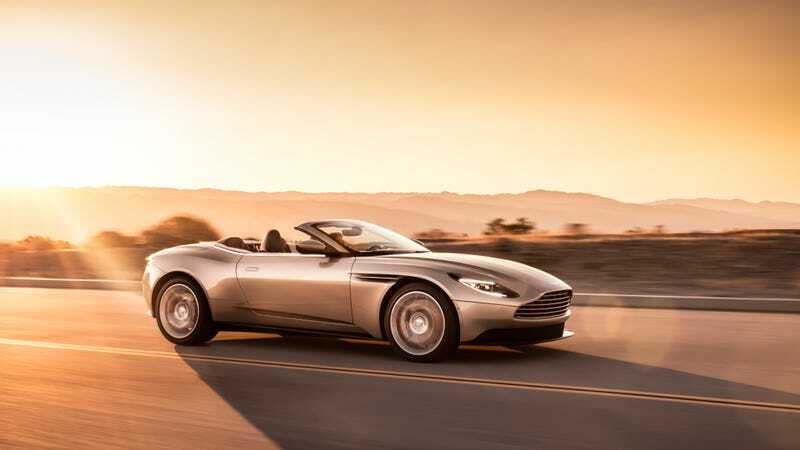 But the new Aston Martin DB11's design seems hard to screw up no matter what you did to it, and luckily its roadster version doesn’t disappoint. Meet the DB11 Volante. “Volante,” to Aston Martin, is a word that means “we cut the roof off.” We knew the new DB11 sports grand tourer would get that treatment and here it is. And it looks good. Aston Martin says the DB11 Volante gets the AMG-sourced 4.0-liter twin-turbo 503 horsepower V8 engine. That powerplant moves the new Aston ‘vert to 62 mph (100 km/h) in just 4.1 seconds with a top speed of 187 mph. Alas, Top Gear reports it will not have the V12 option that its coupe brother gets because of the weight penalty involved. It’s already 240 pounds heavier than the coupe. But is fewer cylinders and a bit of extra weight a fair trade to drive something that looks this nice with the wind in your hair? To a lot of buyers, definitely. I think I could find a way to be fine with it too.